: Approximate dimensions 96mm high x 82mm diameter. Please note mugs may vary slightly in size and these details should be used for guidance only. Bring some love to someone's life with our 11oz Heart Handle PhotoMug. Our Duraglaze® PhotoMugs are the only truly 100% dishwasher proof PhotoMug in Europe. They have been independently tested to over 2000 washes and they simply will not fade! 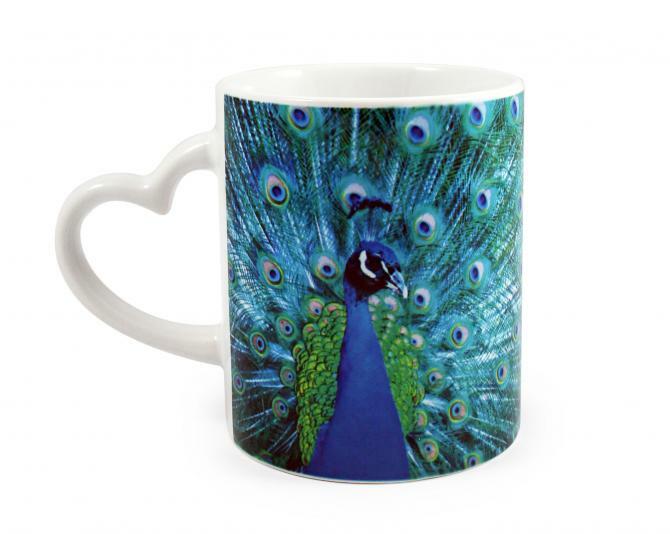 Duraglaze® PhotoMugs out perform any other sublimation mug on the market offering exceptional value for money and will result in satisfied customers and repeat business. We offer our unique Duraglaze® coating on a range of mug body styles ready for sublimation. A Grade - 100% dishwasher proof. Our bestselling selection. Popular with our high volume decorators and those to whom price is a critical factor.